Despite undeniable progress since the civil rights era, the gulf that separates black and white Americans remains vast. This chapter reviews the reasons for this stubborn race gap, focusing in particular on data showing the extent, causes, and impact of housing segregation and health inequity. It proposes concrete recommendations for the new administration to shrink the racial divide, urging strong political leadership, improved housing market mobility, innovative focus on the social determinants of health, and tools to reduce unintentional biases in health care. The first decades of the 21st century have, like the many that came before, been difficult for black America, despite the election and re-election of our first black President. There has been progress on some fronts, including narrower gaps in high school graduation rates, declining rates of teen pregnancy, and fewer suicides among black men. But the median black American will be as just as far behind their white counterpart in 2017 as they were in 2000 in terms of income, wealth, unemployment, earnings, the risk of incarceration, and many measures of health. In the last couple of decades, progress toward broader equity for African-Americans has been halting. Compared to whites, black Americans face the same risk of unemployment today as in the 1960s. 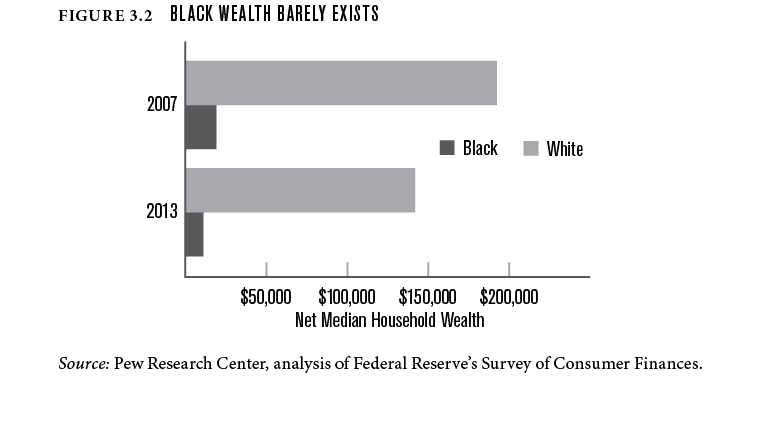 Between 2007 and 2013, the net wealth of the median black household fell from 10 percent to 8 percent of median white household wealth, largely the result of the differential impact of the Great Recession. In other words, the median white household now has a net wealth 13 times greater than the median black household. In 2000 the median black household had an income that was 66 percent of the median white household income. In 2015 that figure was 59 percent. In other words, the median white household now has a net wealth 13 times greater than the median black household. During his presidential campaign, Donald Trump appealed directly to whites, especially those who felt threatened by immigration, trade, and diversity. His choice of words and his choice of advisers have not suggested that the inequalities faced by black Americans are at the top of his agenda. He did point out, however clumsily, the difficulties that many blacks living in cities face in finding jobs or decent schools. If the new administration decides to treat the race gap seriously, there is much that can be done, right now. American neighborhoods have become more diverse in the last 20 years, but the main reason for this is the growth of the Asian and Hispanic-American populations, rather than significant movement by either black or white Americans. Native-born black Americans experience levels of urban neighborhood segregation nearly three times higher than native-born black British citizens. Native-born black Americans experience levels of urban neighborhood segregation nearly three times higher than native-born black British citizens. 1. Zoning. Even in the post-civil rights era, many forms of land use regulation have perpetuated segregation. Complex webs of covenants and zoning ordinances across U.S. cities—in particular for low-density development—superimposed on already highly-segregated neighborhoods, have slowed integration. When there are wide economic gaps by race, as we have in the U.S., exclusionary land-use policies based on families’ economic circumstances entrench racial segregation. 2. Transportation. Highways and runways have often damaged or cut off black neighborhoods. “Highways cut the heart out of poor areas,” as Transportation Secretary Anthony Foxx observed. Meanwhile public transit investments often fail to connect minority communities to opportunities for education and employment. 3. ‘Steering.” Black and other minority homebuyers and renters receive different treatment from realtors and agents. In 2012, white and black “homebuyers” (in fact actors) were sent to 8,000 randomly selected realtors. Black home-seekers were shown 18% fewer homes. There are some signs that realtors “steer” by race with reference to local schools. 4. Credit. After being denied home loans before the civil rights era, black Americans have continued to be denied affordable credit, and have been pushed towards sub-prime loans.4 SunTrust, Wells Fargo, and Bank of America have in recent years settled with the Justice Department (for $21 million, and $175 million, and $335 million respectively) for pushing black homebuyers into subprime mortgage deals, overcharging them for home loans, and other breaches. 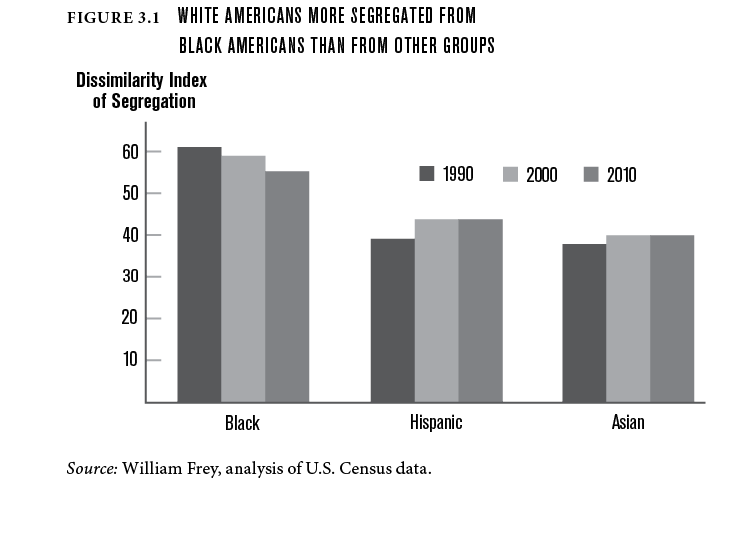 Physical segregation by race is costly to society simply in terms of race relations. It is harder to foster an equal, tolerant, multi-racial society when people of different races live in their own enclaves. But there are more tangible costs, too, especially in terms of wealth disparities, educational opportunities, concentrated poverty and neighborhood effects, with implications for well being and health. Wealth. The median black family has barely any wealth, in large part because blacks have not been able to participate in the wealth-generating momentum of the heavily-subsidized housing market. Many blacks who did get a foothold before the recession fell backwards during the Great Recession, when black median household wealth almost halved from $19,200 in 2007 to $11,000 in 2013. The median wealth of white households is now 13 times greater than for black households—the largest gap in a quarter century (see figure 3.2). Education. There are wide, well-documented race gaps in educational outcomes. School quality is a significant factor here, and since schools tend serve specific areas, residential segregation leads to school segregation, along both racial and economic lines. The compounding effects of wealth, race and place means that even middle-income black students are more likely to attend high-poverty schools, as recent research by Sean Reardon, Demetra Kalogrides and Kenneth Shore shows. 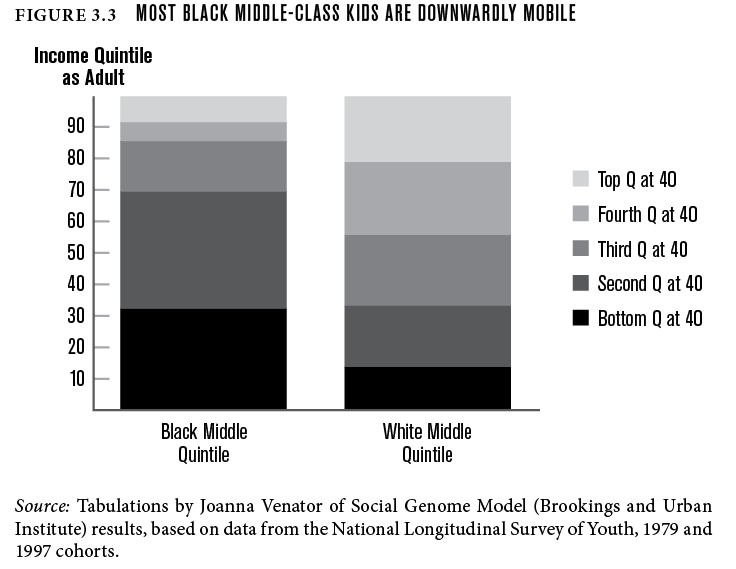 This may be one reason why black children born into middle-income families are twice as likely to be downwardly mobile as middle-income whites (see figure 3.3). Neighborhood effects. People living in areas with higher rates of poverty have worse outcomes across a range of social and economic measures. From sidewalks to social capital, differences in safety and neighborhood quality lead to differences in outcomes, as the case-studies jointly produced by the Community Affairs Offices of the Federal Reserve System and Brookings show. Children in poor families that were able to use a voucher to move to a low-poverty neighborhood saw a 16 percent increase in college attendance and were much less likely to become single parents, compared to a control group; those who moved earned 31 percent more in their mid-twenties. Residential segregation in terms of race is deep, and damaging. What can be done? A complex and enduring problem like segregation will not be solved quickly or easily. It will require sustained political attention and policy efforts from federal and local government. The president’s role may seem limited at first. But there is plenty that she or he can do, even without new laws or funds. Many of the powers needed to make progress already exist; they simply need to be used. Below we sketch out a concrete policy reform, one element of a wider strategy to tackle segregation. But the most important ingredient is political leadership—from the new President, but also from the people that she or he appoints to critical roles in the administration. All of these proposals will require leadership from the new President. But it will also require bolder action from HUD. Leadership of that Department is critical. We need another Romney. George Romney, that is. “Some white people and public officials will advocate the return to state’s rights as a way to legalize segregation,” he said in the wake of the 1967 race riots: “As citizens of Michigan, as Americans, we must unhesitatingly reject all these divisive courses.” He then enacted a statewide fair housing law and told voters he wanted to end local zoning where it facilitated segregation and evenly distribute affordable housing around metro areas. In many metro areas, HUD benchmarks the value of housing vouchers to costs in the entire metro. This means voucher holders can’t afford to rent in more expensive, opportunity-rich neighborhoods, and are effectively pushed into neighborhoods with cheaper housing. In some places, like Dallas, voucher amounts are indexed to zip codes, rather than entire metro areas. This means the allowance falls slightly in lower-rent areas, but rises in higher-rent areas. In a recent study of this “small area fair market rent” (SAFMR) approach in Dallas, Robert Collinson and Peter Ganong find that SAFMR led voucher families to enter neighborhoods with less poverty and violent crime. Across five SAFMR demonstration sites, the total cost of the program actually fell by 5 percent between 2012 and 2014. This doesn’t mean that SAFMR will make sense everywhere, but HUD should permit and encourage more cities to adopt the approach, especially in those areas with concentrated poverty. Opening up broader, regional markets for voucher recipients will help to create more integrated cities; a powerful complement would be “mobility counseling” that helps voucher holders find a new residence. In Chicago, the Housing Opportunity Program offers a range of services, including housing search counseling and unit referrals, free credit reports, financial counseling, transport to potential new homes, expedited HUD Quality Standards inspections, legal workshops, and post-move support and house visits. The program helps families move to lower-poverty neighborhoods, according to longitudinal research, including a 2005 analysis by Mary Cunningham and Noah Sawyer. Recent analysis of the Baltimore Mobility Program suggests that families who get this kind of extra support raise their neighborhood and school expectations, and move to areas with higher-quality schools. As the new administration and Congress design the ACA replacement,7 it is important to remember that increased access is necessary but not sufficient to close morbidity and mortality gaps between blacks and whites. Health disparities resulting from racial inequity will persist as long as our nation continues to tolerate a separate and unequal health care system for black Americans. African Americans are disproportionately treated at health care facilities with the fewest technological resources, the most poorly trained professionals, and least experienced clinicians serve predominately black patient populations.11 The most highly trained professionals serve predominately white populations.12 When compared to whites, black patients are referred to see specialists less often, receive less appropriate preventive care such as mammography and flu vaccines, receive fewer kidney and bone marrow transplants, receive fewer antiretroviral drugs for HIV, receive fewer antidepressants for diagnosed depression, and are admitted less often than whites for similar complaints of chest pain.13 No single cause explains these disparities, but five stand out. 2. Social determinants of health. The next administration must also address racial disparities in the social determinants of health. These are the conditions in which Americans live, work, and play—including access to clean, safe, affordable house and health food choices. Health care alone accounts for only 10 percent of health outcomes. Social and environmental factors (20 percent), genetics (30 percent), and behavior (40 percent) all have a greater influence on health than health care. Closing the gap in health outcomes for blacks and whites means addressing inequity in upstream social and environmental factors that impact health. 5. Criminal law enforcement. The next administration can improve health equity by addressing instances of discriminatory law enforcement that disproportionately affect black communities. 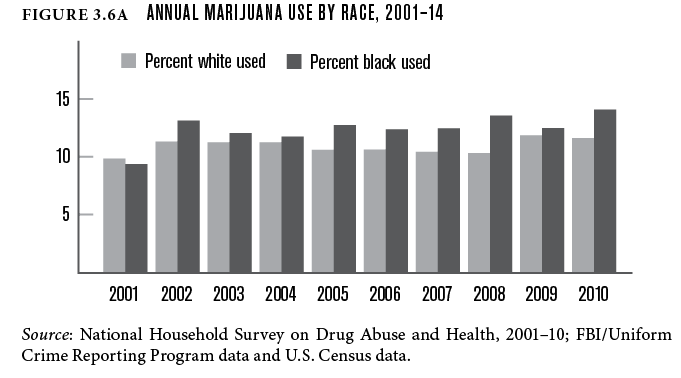 Black men and women are more likely to be arrested, charged, and convicted of crimes than whites who commit the same crimes (see figure 3.6);20 disparate marijuana arrests are exemplary.21 Once convicted, black men receive prison sentences that are nearly 20 percent longer than white men for similar crimes. The new President’s most important step to achieve health equity will be to provide strong political leadership on this issue from day one. The new president must ensure that political leaders are committed and empowered to fight health inequity to the full extent of the law. This must be true throughout the federal family, and especially so for Dr. Tom Price and Scott Pruitt, the people who will occupy the positions of secretary of health and human services (HHS) and administrator of the Environmental Protection Agency (EPA). Similarly, political leadership in both agencies’ offices of general counsel and offices of civil rights must be individuals charged by the president and demonstrably committed to make the elimination of health disparities a top administration priority. Section 1557 and its accompanying regulations provide powerful enforcement tools for the federal government to prohibit discrimination on the basis of race by health programs and activities. However, despite the strong final rule implementing the statute, Section 1557 is underutilized against racial health inequity. Currently, no sample or reported cases involving use of this statute to combat race discrimination in health care appear on the HHS website. The president can use existing interagency working groups to significantly enhance deployment of Section 1557 as a weapon against racial discrimination—whether conscious or unconscious—that produces health disparities. More than two decades have passed since President Bill Clinton signed the historic Executive Order 12898 on Environmental Justice, yet the order has not been fully implemented. The new president has an opportunity to live up to the promise that in America, “no matter who you are or where you come from, you can pursue your dreams in a safe and just environment.”30 Improving Title VI civil rights enforcement is the place to start. Currently, the EPA dismisses or rejects over 90 percent of Title VI complaints, takes an average of 350 days to complete jurisdictional reviews,31 and has never in its history made a formal finding of discrimination. The EPA has never denied or withdrawn financial assistance from a recipient. And the agency’s civil rights office has cases on its Title VI docket that were filed more than 10 years ago.32 Making the promise of this executive order a reality will help reduce health disparities suffered by black Americans. In sum, the new president can, by reducing the inequality that separates blacks and whites, not only improve economic growth, social mobility, health, and opportunity for many, but also ensure justice for all Americans. This is a phrase used, in a different context, by Gerry Cohen in his book If you're an egalitarian how come you're so rich? Here, “integration” means that each census tract’s demographics match those of the larger metro. This 2120 figure assumes that more integrated metropolitan areas would experience additional integration at historical rates, which isn’t how things have played out in the past. See, for example, racist lending practices within the Federal Housing Administration during the 20th century. Redlining furthered segregation, and continues today; see here and here. Here is a list of examples of redlining in the past few years. Another example: Wisconsin’s largest bank, Associated Bank, just settled with HUD over discriminatory lending. Now they have to finance $200 million in home loans in minority census tracts, fork over $10 million in down-payment assistance, open four new offices in minority neighborhoods, and spend $1.4 million on marketing to these underserved communities. See here and here. Even fairly small differences in the kinds of communities people prefer to live in can have significant aggregate effects, as Thomas Schelling's work famously showed, especially in his book Micromotives and Macrobehavior. Lindy Washburn, “Medical Mystery Endures: Black Babies at Twice Risk of Whites for Death, Study Indicates,” Medical Press (March 2, 2011) (available here: http://medicalxpress.com/news/2011-03-medical-mystery-black-babies-whites.html). 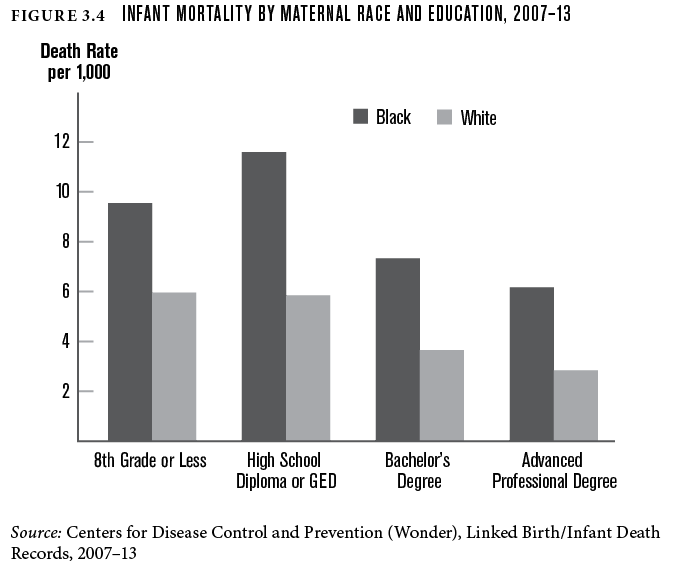 Laudan Y. Aron, (August 26, 2013) “Despite Fifty Years of Improvements in Infant Mortality, Large Black-White Gap Remains Unchanged,” Urban Wire: Poverty, Vulnerability and the Safety Net. (available here: http://www.urban.org/urban-wire/despite-fifty-years-improvements-infant-mortality-large-black-white-gap-remains-unchanged). S. Jay Olshansky, et al., (2012). Differences in Life Expectancy Due to Race and Educational Differences are Widening, and Many May Not Catch Up, Health Affairs 31(8):1803-1813. Justin B. Dimick, et al., (2013). Black Patients are More Likely to Undergo Surgery at Low Quality Hospitals in Segregated Regions, Health Affairs (Millwood)< 32(6):1046-1053; Laurent G. Glance, et al. (2013). Popescu, (2011). Differences in Admitting Hospital Characteristics for Black and white Medicare beneficiaries with Acute Myocardial Infarction. Circulation 123(23):2710-2716 (Differences in hospital quality, which may be due in part to zip code differences, may contribute to disparities). Kevin Fiscella and others, “Inequality in Quality: Addressing Socioeconomic, Racial, and Ethnic Disparities in Health Care,” JAMA 283, no. 19 (2000), 2579–84. U.S. Department of Health and Human Services, “2015 National Healthcare Quality and Disparities Report and 5th Anniversary Update on the National Quality Strategy,” AHRQ Publication no. 16-0015 (Rockville, Md. : Department of Health and Human Services, April 2016). Bianca DiJulio and others, “Kaiser Family Foundation/CNN Survey of Americans on Race” (Washington, D.C.: Kaiser Family Foundation, November 2015). James Krieger and Donna L. Higgins, “Housing and Health: Time Again for Public Health Action,” in Urban Health: Readings in the Social, Built, and Physical Environments of U.S. Cities, edited by H. Patricia Hynes and Russ Lopez (Burlington, Mass. : Jones and Bartlett Publishers, 2009), 106. Liam Downey and Brian Hawkins, “Race, Income, and Environmental Inequality in the United States,” Social Perspectives 51, no. 4 (2008): 759–81. R. Williams and C. Collins, “Racial Residential Segregation: A Fundamental Cause of Racial Disparities in Health,” Public Health Report 116, no. 5 (2001): 404–16. 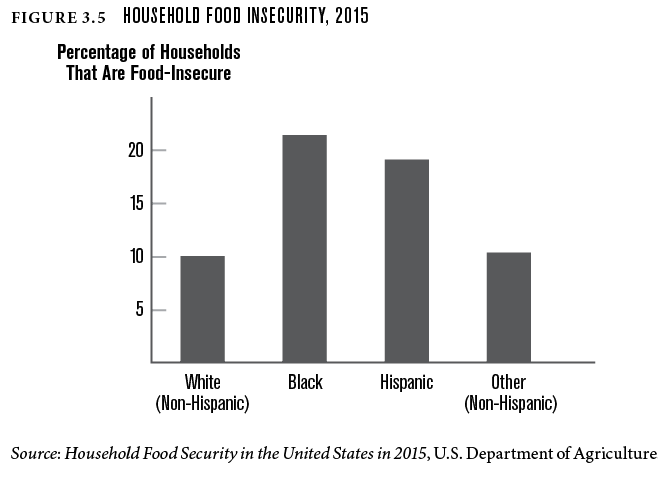 Angela Hilmers, David C. Hilmers, and Jayna Dave, “Neighborhood Disparities in Access to Healthy Foods and Their Effects on Environmental Justice,” American Journal of Public Health 102, no. 9 (2012): 1644–54. 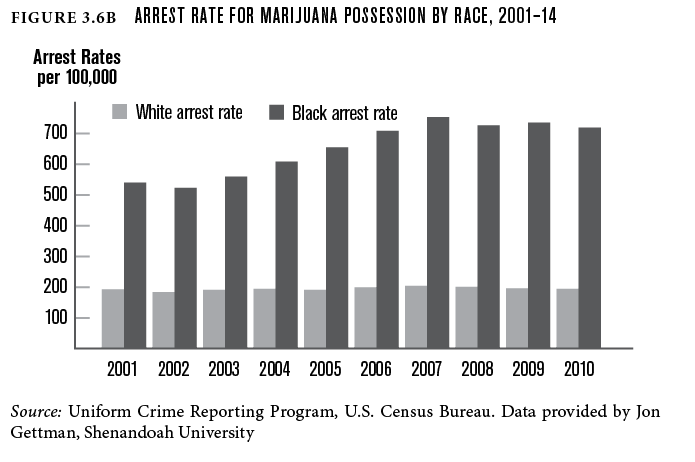 Dylan Matthews, “The Black/White Marijuana Arrest Gap, in Nine Charts,” Washington Post Wonkblog, June 4, 2013. Sandro Galea, “Incarceration and the Health of Populations,” Boston University School of Public Health, March 22, 2015, www.bu.edu/sph/2015/03/22/incarceration-and-the-health-of-populations/. Editorial Board, “Mass Imprisonment and Public Health,” New York Times, November 26, 2014. Christopher Wildeman, “Imprisonment and (Inequality in) Population Health,” Social Science Research 41 (2011): 74–91. Jonathan Klick and Sally Satel, The Health Disparities Myth: Diagnosing the Treatment Gap (Washington, D.C.: American Enterprise Institute Press, 2006). Joe Palazzolo, “Racial Gap in Men’s Sentencing,” Wall Street Journal, February 14, 2013. David Satcher and others, “What If We Were Equal? A Comparison of the Black-White Mortality Gap in 1960 and 2000,” Health Affairs 24, no. 2 (2005): 459–64. Carrie Hanlon and Larry Hinkle, “Assessing the Costs of Racial and Ethnic Health Disparities: State Experience” (Rockville, Md. : Health Care Cost and Utilization Project, June 24, 2011). Thomas A. LaVeist, Darrell J. Gaskin, and Patrick Richard, “The Economic Burden of Health Inequalities in the United States” (Washington, D.C.: Joint Center for Political and Economic Studies, 2009). See, for example, Executive Order 11246, as amended by Executive Orders 113575 and 10286 and applicable regulations. See, for example, Lisa Garcia, “President Obama’s Proclamation on Environmental Justice,” EPA blog, February 25, 2014, https://blog.epa.gov/blog/tag/executive-order-12898/. Editorial Board, “The E.P.A.’s Civil Rights Problem,” New York Times, July 7, 2016. U.S. Commission on Civil Rights, “Environmental Justice: Examining the Environmental Protection Agency’s Compliance and Enforcement of Title VI and Executive Order 12,898” (Washington, D.C.: September 23, 2016).